False-color overlay of the radio and X-ray emission from the inner part of the Virgo Cluster of Galaxies. 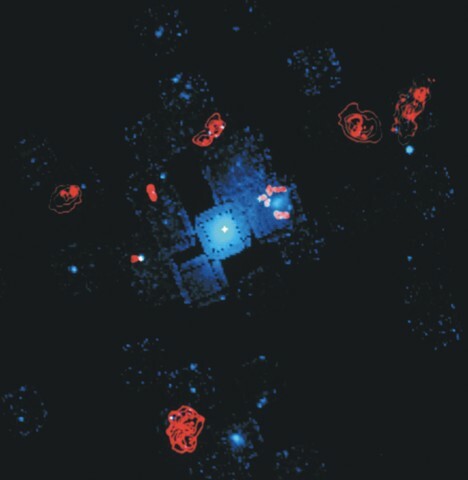 The X-ray image, obtained by the Einstein (HEAO-2) X-ray satellite, is coded in blue, the radio image, obtained with the VLA, is coded red. While in X-rays, the central giant elliptical galaxy M87 is dominating and some other X-ray bright galactic cores are visible (such as M86), the radio image mainly shows emission of interstellar matter (hydrogen, H I), in particular from the dominating spiral galaxies in the cluster. The X-ray image is a mosaic of many individual observations.